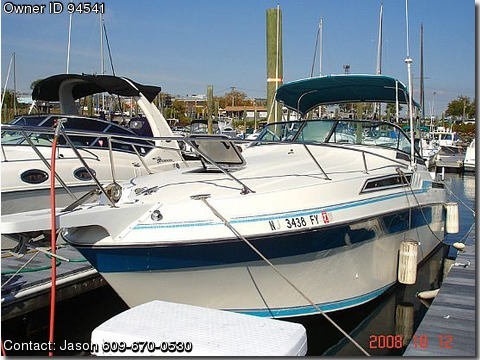 Call Boat Owner Jason 609-670-0530. The Wellcraft Antigua is extremely spacious for its size and sleeps 4 comfortably. It has a well planned layout that offers a forward and aft berth with 1 head and shower combination. It also offers a spacious saloon and galley with dinette. There is lots of room for the 28 footer. The cockpit offers a full enclosure with bimini top camper canvas for all season cruising. The engine was replaced in 1996 and has about 400 hours on it. The exhaust manifolds and ignition control module were replaced last season. The bellows transom assembly, alternator, risers and exhaust flappers and circulating pump were replaced 4 months ago. The engine was removed and bilge was cleaned. The interior was reupholstered 4 months ago and features LED lighting with a 19inch LCD DVD combo. Galley includes an alcohol electric stove. The head is electric with a holding tank. Electronics include a Garmin 540s with depth sounderfish finder, vhf radio and back up sitex depthfish finder, 2 batteries with a 20 amp promariner charger and battery status monitor. This boat is very nice and turn key.